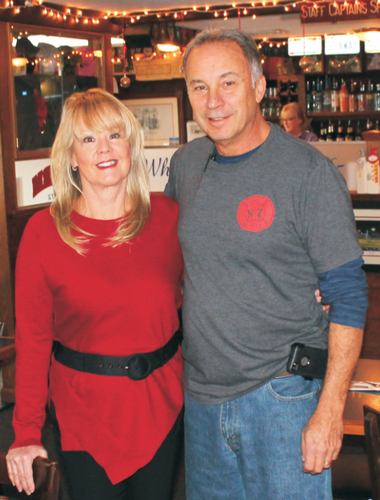 Owners Carol and Tony Barreiro invite you to The Yardarm! Every town has one . . . that neighborhood gathering place where friends meet for a drink, some conversation and conviviality, where upon entry you're greeted with a smile and a thanks for coming, and where, when you get hungry, a table is waiting and the food is solid, as is the service. In Orleans, we're that place. 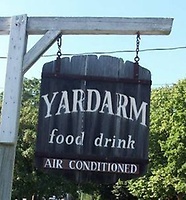 The Yardarm. Since 1971, we,ve been the spot on Outer Cape Cod where friends meet and friends are made. Local color abounds, from fishermen to physicians, tradesmen to tourists, all rubbing elbows at the bar and extending conversation from table to table while the Red Sox or the Patriots appear on our many TVs. Our restaurant has an extensive menu of local seafoods, chowders and soups, steaks and burgers. Every day the Specials Board goes up with even more offerings to tempt you with appetizers and finger foods, the day's fresh catch right off the boat, the burger of the day, the lunch specials and much more.